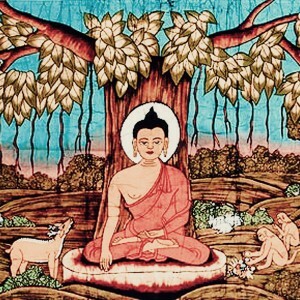 Nagarjuna elaborates on what we now call Madhyamaka philosophy in commentaries on the direct or true meaning of the Prajnaparamita Sutras in his “Collection of Middle Way Reasoning“. 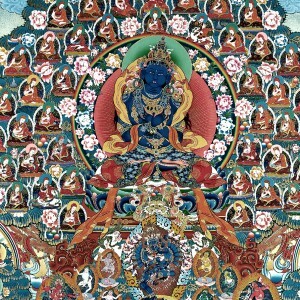 This is a group of six texts Nagarjuna wrote, the famous main treatise titled “Root Verses of the Middle Way on Wisdom“. This “Middle Way” is defined as one between the extremes of annihilationism and eternalism, both of which are refuted by Nagarjuna because they are dependently co-arisen. 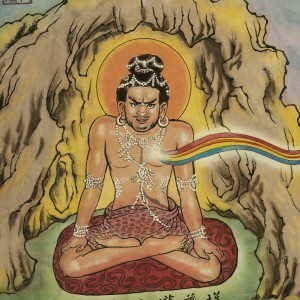 Nagarjuna is also said to be an accomplished alchemist/metallurgist who could transmute iron into gold. 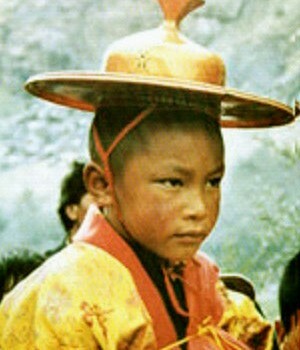 Common amongst all traditions of Tibetan Buddhism, the domed hat is traditionally worn by Tibetan lamas while travelling on the road to protect themselves from the elements. 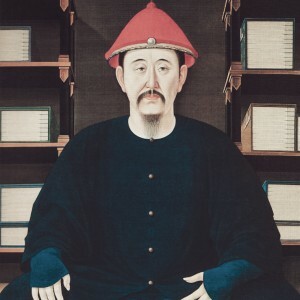 Hence, the golden domed hat also symbolises Dorje Shugden’s mobility and swiftness in coming to the aid of sincere practitioners who practise the Middle Way. Dorje Shugden doesn’t just stay in one place; he is always moving, always traveling and always on-the-go to help whomever calls upon him. Dorje Shugden’s golden domed hat is adorned with gold from the Dzambu river. In Buddhist cosmology, the centre of the universe is Mount Meru or Mount Sumeru (Tibetan: ri rab), a huge mountain with four sides made of precious stones and full of the most wondrous things. Around Mount Meru is a vast lake, and around this lake is a chain of golden mountains. Behind this chain of mountains is yet another lake surrounded by golden mountains, and this repeats itself seven times – seven lakes and seven chains of golden mountains. Beyond the last chain of mountains is the lake Chi Gyatso. Chi Gyatso is where the four worlds were founded, each like an island with its own specific state and inhabitants. Our own world to the South is called Dzambu Ling. Thus, Dorje Shugden’s domed hat being adorned by gold from the Dzambu river is another indication that Dorje Shugden is accessible to us, close to us, the inhabitants of Dzambu. So, Dorje Shugden’s golden domed hat tells us that he protects the practitioners and upholders of the true meaning of the Prajnaparamita Sutras as taught by Buddha Shakyamuni, which was elaborated by Nagarjuna and perfectly taught by Lama Tsongkhapa. He is ever mobile, swift and ready to aid the inhabitants of this world. Answers the question why Dorje Shugden is protector of our time. Why he is so suitable to come to our aid. He is right here within our 6 realms and in our corner of the world – Dzambuling. Even the hat is shaped like a lama’s hat, showing that he is travelling all the time. Such compassion to be here to answer our distressed call. 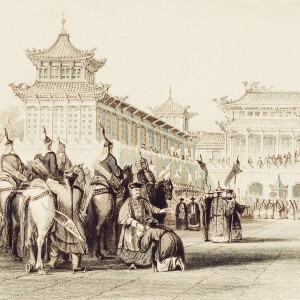 As explained in this write up, Lamas of Tibetan Buddhism wear a domed hat as they travel far and wide to propagate the Dharma. This means that it is a traditional travelling hat. Explains why Dorje Shugden wears such a hat as he travels to every corner of the worlds to assist and protect sincere practitioners. 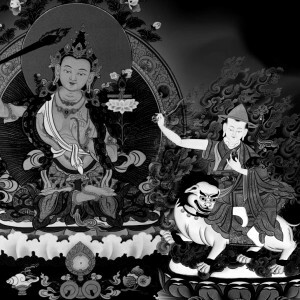 It is very good to know the significance of Protector Dorje Shugden’s iconography with our practice. 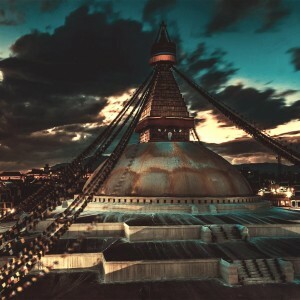 Dorje Shugden’s golden domed hat is represented the highest view of Madhyamaka, Nagarjuna’s special view of Emptiness as embodied perfectly in Lama Tsongkhapa’s teachings. Its golden domed hat also symbolises Dorje Shugden able to help the practitioners swiftly especially those who are sincere practise the Middle Way. 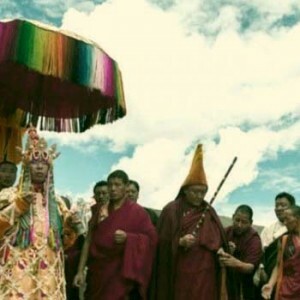 Thank you for sharing this explanation about Dorje Shugden’s golden domed hat. Dorje Shugden’s golden domed hat is symbolic of the protection he grants to practitioners and upholders of Madhyamaka, Nagarjuna’s special view of Emptiness as embodied perfectly in Lama Tsongkhapa’s teachings. The gold of the hat is from the Dazmbu river. 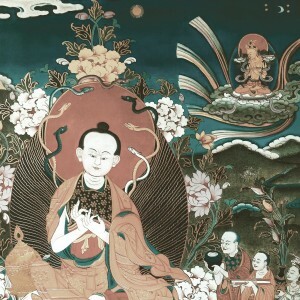 Nagarjuna upholds the Madhyamaka philosophy , which is the philosophy of the Middle View of Emptiness,the correct view of Emptiness or the direct or true meaning of the Prajnaparamita Sutras. The Middle View avoids the extremes of nihilism and eternalism, both of which are refuted by Nagarjuna, because both are in actual fact interdependently arisen. Dorje Shugden’s dome-shaped hat made of gold from the River Dzambu, which, according to Buddhist cosmology flows in the Southern Continent -Earth- shows that Dorje Shugden is close to us and accessible.The golden domed hat also symbolises Dorje Shugden’s mobility and swiftness in coming to the aid of sincere practitioners who practise the Middle Way.He can come to our aid very swiftly. 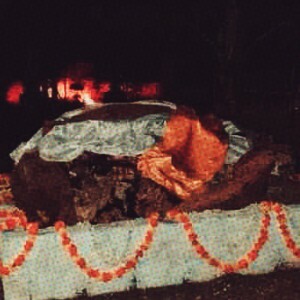 Dorje Shugden’s dome-shaped hat that symbolises Nagarjuna’s middle or correct view of emptiness,as taught perfectly by Lord Tsongkhapa, shows us undeniably that Wisdom Manjushri has come to us in this degenerate time in an accessible way, through a Protector that arose to ensure that beings of this degenerate age are led to the realisation of the truth of the emptiness of self swiftly and thus are able to cut delusions and suffering swiftly and incisively. The iconography and symbolism of Tibetan Buddhist are profound yet logiacl at the same time. 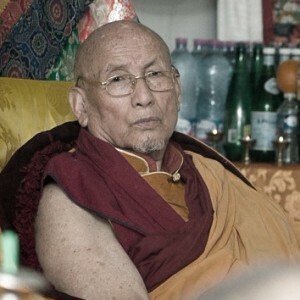 For example, the Gold Dome Hat wore by the enlightened Dharma Protector, Dorje Shugden. 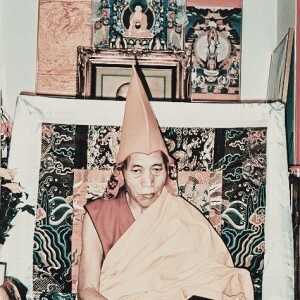 The Gold dome Hat represents the promise of protection from Dorje Shugden towards the practitioners of Nagjurna’s view in emptiness, which is enshrined in Lama Tsongkhapa’s teaching. 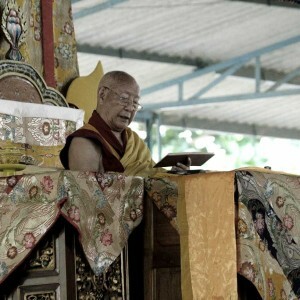 In Tibetan Buddhism cosmology, Dzambu Ling the southern atmosphere where us human resides. Therefore, as the gold color of Dorje Shugden’s hat has been adorned with the gold from Dzambu River, it signififies the close distance between Dorje Shugden and the pratitioners, hence the swift assistance he can provide when called upon. As we understand more about the iconography of Dorje Shugden, we will be assured that they are signs of an enlightenment being. When we propiate Dorje Shugden, we will be guided and guarded on the path towards spiritual enlightenment. 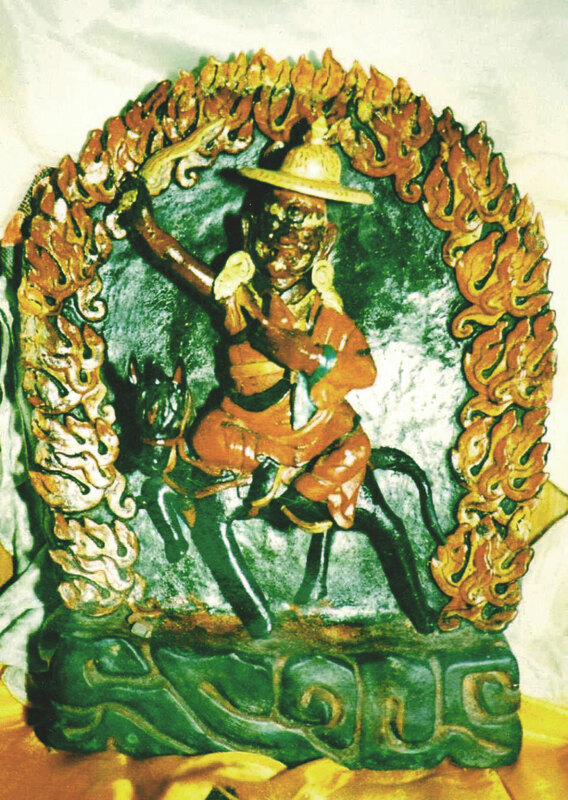 Dorje Shugden’s dome hat represents his swiftness in assisting the practitioners when called upon for help. 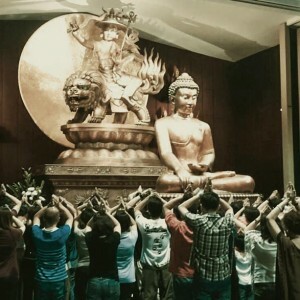 Dorje Shugden will help dharma practitioners in clearing their obstacles that comes along their spiritual path so that the practitioner can progress smoothly in the path. 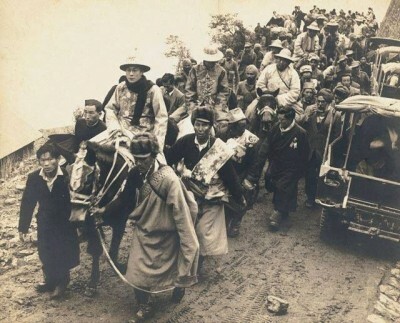 Many of us who have been practising Dorje Shugden for quite a while already will experience the swiftness of Dorje Shugden when called for help and assistance. ” Golden domed hat also symbolises Dorje Shugden’s mobility and swiftness ” which shows the compassion state of Dorje Shugden. This is one thing i like about Tibetan Buddha iconography as there are explanation on what each buddha wears and also holds. Explanation of the iconography makes you understand the buddha better and faith towards buddhism increases instead of relying on blind faith. Thank you for the explanation of the domed hat. We now understand the significance of this travelling hat which provides swift protection and assistance to practitioners. We can call upon him when we need help. That is also why Dorje Shugden is the protector of our time when he supports us in our Dharma growth in this Kaliyuga times. Thank you for explaining the iconography of the golden domed hat. 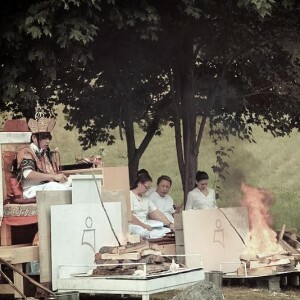 Buddhism is not an idol worshipping religion. There is a meaning behind every details depicted on an Buddha image, and the meaning makes a lot of sense. It is important to understand the iconography to strengthen our faith and to be able to explain to others who have doubts. 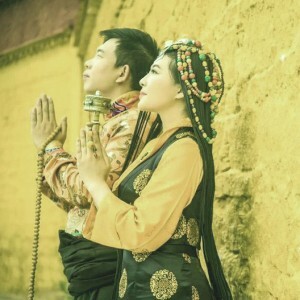 The symbolism in Tibetan Buddhist iconography is a form of communication and expression to the viewer and each of the objects represent different meaning that relate to our understanding. Each of the deity has different forms and with different iconography that help the practitioners to visualise during meditation and for higher practitioners they are tools for them to reach certain goal. It’s very important for us the practitioner to understand the meaning of each Buddha’s iconography to help us in our practice and gain more faith. 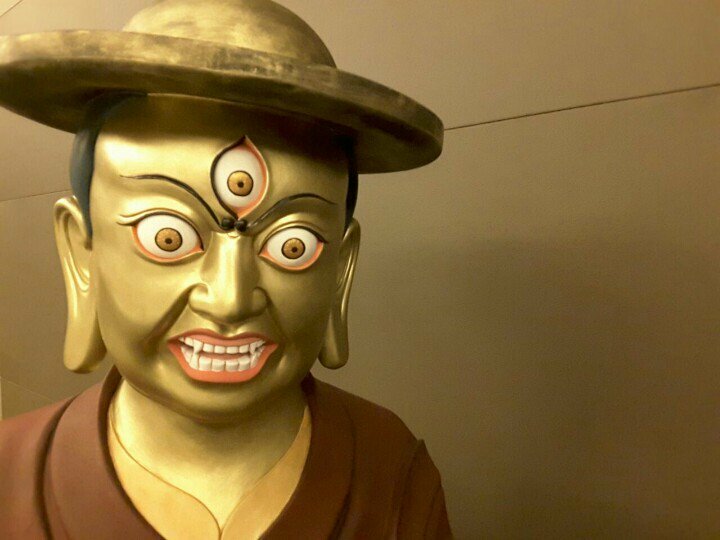 Dorje Shugden’s hat is just like what we have in modern days and it just shows how He is the protector of our time, that even His hat, sword, boots etc we can relate them in modern appearance and terms. Apart form Dorje Shugden’s mobility and swiftness in coming to aid sincere practitioners, Dorje Shugden wearing the golden domed hat shows that in his past incarnations he was a high Tibetan Lama, as Tibetan Lamas wore the domed hat traditionally while travelling on the road. It is important to learn the iconography of Buddhas and what each specifically represents as the teachings of the Buddhas is represented in its iconography. 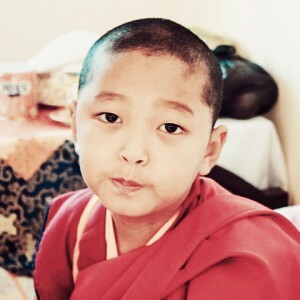 We pray to Buddhas, but understanding what we are praying to and why is much more powerful than merely praying. 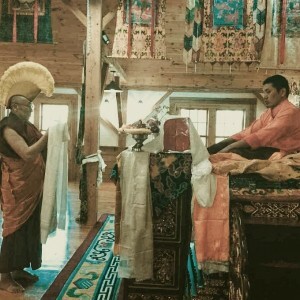 Dorje Shugden has no bias in this help, and very swift. As we do our prayers to him daily, we continue to build on the proximity of the relationship we have with him, and in time, his assistance towards us becomes much more swift. 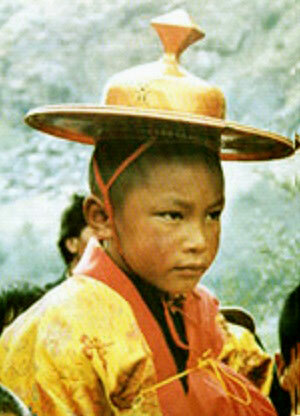 Golden domed hat is traditionally worn by Tibetan lamas during travelling to protect themselves from the elements. Dorje Shugden is wearing a golden domed hat too which represents he is constantly traveling and grant his protections to practitioners. The golden domed hat also represents the highest view of Madhyamaka, Nagarjuna’s middle or correct view of emptiness which taught perfectly by Lama Tsongkhapa. 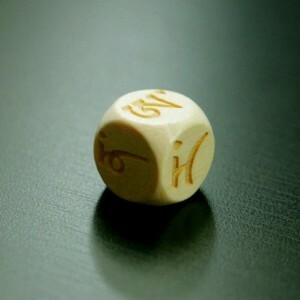 According to Buddhist cosmology, our world to the South is called Dzambu Ling. Dorje Shugden’s domed hat was adorned by gold from the Dzambu river, an indication that Dorje Shugden is accessible to us. It is always good to know and memories meaning of each iconography. It helps when we are doing visualization during prayers and meditations. 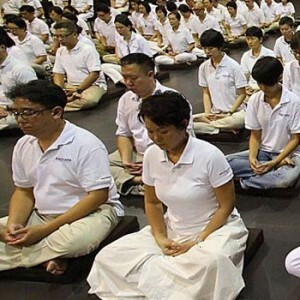 Our faith in dharma practice will grow stronger.